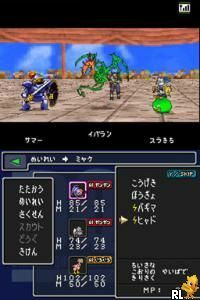 Just like the old GameBoy and GameBoy color titles, Dragon Warrior Monsters and Dragon Warrior Monsters 2, this title has a focus on befriending the monsters instead of other NPC players. The story line is fairly good and simple to follow and can keep you interested until the final battle. The only difference that is of significant importance from prior generations is the breading system for the monsters. (now known as synthesis, probably to not offend anyone.) Where one could breed monsters in the older version and get a specific monster from the base and paired monster, this version lets you chose your base and paired monster but also allows you to chose to create a monster of a whole different type from using BOTH monsters as a base! This comes in very handy when you are trying to gather lower ranking monsters but can not or do not have any low ranking breeders to throw in the mix. Over all this is a very good rendition, however some aspects can get fairly annoying in the later part of the game which seems like they try to make the play time last longer forcibly. Now you can add videos, screenshots, or other images (cover scans, disc scans, etc.) 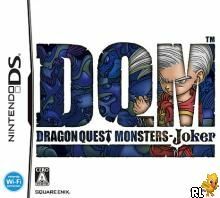 for Dragon Quest Monsters - Joker (J)(WRG) to Emuparadise. Do it now!